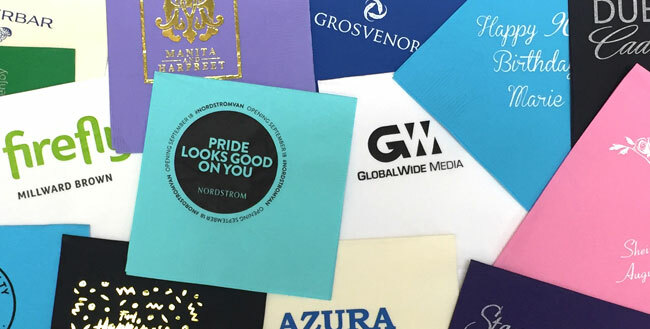 Whether your next event is a corporate gathering, trade show or wedding, custom napkins will provide additional brand awareness and make your special day stand out. With over twenty napkin colours and three napkin sizes available, our professionally printed napkins will make impressive additions to your business and social functions. 5” x 5” cocktail • 6.5” x 6.5” luncheon • 4“ x 8” dinner. We offer a wide range of napkin colours, click to view Colour Chart. Napkins are two-ply print quality with embossed edges. Minimum order is 100 units. We custom print paper napkins on site at our Vancouver, BC location in one colour ink or foil. Foil colours available include matte black, matte white, metallic gold and metallic silver. View Pantone Ink Colour Chart which includes metallic ink options. Please note that white ink is transparent so white foil is used which is opaque. For multi colour printing, contact us for a quote. Full colour printed napkins available for orders of 40,000 & up. Prices are based on 1 design per order. If you have multiple designs, please contact us for a quote. Napkins are stacked in boxes with packing paper. Contact us for a quote on packaging napkins in sets in poly bags with bag toppers. Visit our coasters, pin back buttons, fridge magnets and bottle openers pages. Also, take a look at our Idea Guide, which provides popular promotional products for various industries and events.